Eucharia discusses her favorite plays. Todd: Eucharia, why don’t we talk about what is our favourite Shakespeare play and actually what is the story about? Eucharia: OK, I love the story of Romeo and Juliet (I know, I’m a girl!) which is a tragedy. It’s about a boy and a girl who fall in love but unfortunately their families are sworn enemies of each other and it ends up with both of them killing themselves, so it’s quite a sad play. Todd: So that’s a tragedy, right? Eucharia: That’s a tragedy. I also like Hamlet. Hamlet the play opens and we see Hamlet talking to the ghost of his father and the ghost explains to Hamlet that he was killed by his brother who has now become Hamlet’s stepfather because he married Hamlet’s mother. So hamlet has to avenge his father by killing his stepfather slash uncle. And Hamlet procrastinates throughout the play: he keeps on putting it off and putting it off and putting it off, and at the end, because he has put it off the situation just gets worse and worse and the reason I like Hamlet is I’m exactly the same. I procrastinate if I don’t want to do something, for example if I don’t want to correct homework my appartment gets cleaned, my car gets cleaned, I clean out the computer… I’m like Hamlet but eventually I do correct the homework! Todd: You’re not going to go and kill your uncle? Eucharia: No, no, nothing like that. I could kill some of the journals that I get sometimes (the homework). But I also love Shakespeare’s comedies. They have this timeless quality: they’re funny now and they’re funny to many different cultures even though humour is a culturally related issue, but I think Shakespearian comedy might.. er ..are accessible to all. I like The Taming of the Shrew and I don’t know if you remember an American soap opera called ‘Moonlighting’ with Bruce Willis and Cybill Shepherd and they did a version of The Taming of the Shrew and I saw it when I was a child and I thought ‘wow that’s a really funny story for that particular soap opera’ . Erm and I remember in school I had to study the sonnets and I really liked them which surprised me because I’m not a big poetry person but I really found Shakespeare accessible. 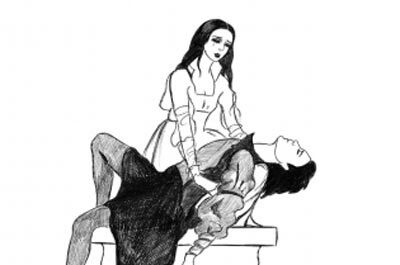 I love the story of Romeo and Juliet which is a tragedy. It was an absolute tragedy that they lost their dog a week after they bought him. The surprise party was a complete tragedy; nobody came. Their families are sworn enemies of each other. After the big argument, they were sworn enemies for the rest of their lives. When I was twelve years old, my sworn enemy stole my boyfriend. Hamlet has to avenge his father by killing his stepfather. To avenge her brother's death, she started a campaign against drunk driving. She made a public statement against him to avenge what he had said about their romance. But I also love Shakespeare’s comedies. They have this timeless quality. You black dress is timeless. Frank Sinatra's music is timeless. People will listen to it forever. I’m not a big poetry person but I really found Shakespeare accessible. Although I don't understand computers well, that program was very accessible. Because the ruins were easily accessible there were always a lot of people there. We need to make some changes to make our website more to people who aren't good with computers. Even though they were neighbors, they were enemies. The loss of her grandmother's wedding ring was a complete . She tried to her sister's broken heart, but ended up just making the situation worse. Even though it's expensive, this dress is .